Ugh! Too much to blog about and too little time! I have been wanting to write and post this for a while, but it turns out the delay worked out OK, since now I'm able to incorporate some more recent comments and articles about the bullet train. The final version of the May 23, 2016 schedule was published on April 14, 2016. Official announcement page is here, with links to the new schedules. The reason it says "for informational purposes only" at the bottom of the new schedules is that those tables are not the official schedule format that will be published and made available shortly. But those are the final schedules - don't get worried that they're thinking of changing anything. First and foremost, let's acknowledge the success of the public comment and public meeting process. They solicited input and made changes to the draft schedules according to the feedback they got. Probably not perfect for everyone, but from my perspective, they did a good job under the constraints (logistical and political) that they were operating under. A pretty good example of a government agency working well, in my humble opinion. Remember - the schedules were entirely developed and driven by the MBTA - NOT Keolis. MBTA sets the schedules, Keolis implements them. And I'm not just kissing up to the MBTA folks reading this blog, for all you folks that think I'm just a shill. So what do I think? You can read all of my previous posts on the new schedule with this handy "new schedule" category link. But I'll consolidate my thoughts here - and add some new thoughts - just to make this post ridiculously long, like so many of my posts. 1. Bullet Train: Oops, sorry, it's the "Heart To Hub." I've previously discussed my disdain for this service, but I'll summarize my opposition below. I'm well aware that there are passengers who will benefit from this train and are excited to see it added to the schedule. I mean them no ill will. I'm looking at it from the perspective of ALL the riders at ALL the stations (and the bullet doesn't really affect me, since I commute from Framingham, which has plenty of good service). a) Reduces service for stations from Grafton to Ashland. They go from seven morning rush inbound trips to six. In the afternoon rush outbound, the trips increase from six to seven, but this also includes the expansion of the definition of rush hour to include the new 3:30 PM South Station departure. But more important is the concept that if the "bullet" equipment were re-purposed to include Grafton to Ashland the service would be more equitable for all 'distant' stations (beyond Framingham). Service could be much more evenly distributed in the morning and an express train (serving all 'usual' express stops) could be added in the evening after 6 PM, which many people have asked for. See my "How would I fix..." write-ups on this blog post for more details of how I would re-use the bullet equipment. b) Requires track to be 'clear' while bullet moves through. They have somewhat mitigated this problem in the morning with train P510 making the Wellesley stops (see below) but there is still a huge gap in service for the Grafton to Ashland stations from about 7:50 AM to 9:00 AM. The evening bullet train really doesn't push any service out of the way since the evening bullet is so far outside rush hour. c) Minimal incremental benefit for big cost. Transit time for the bullet train is 1 hour 2 minutes in the AM and 1 hour 5 minutes in the AM (end to end). For the 'regular' express trains, transit time is about 1 hour 20 minutes. The benefit of the 'bullet' is 15 to 18 minutes but the cost is the issues highlighted above. Not a fair trade-off in my opinion. d) The actual times that the bullet operates are odd. Understanding that these may be targeted towards the 'millennial' passenger with flex time and a shifted work schedule (later), it still seems odd to me. However, with only two tracks and limited crossovers on the mainline, there is no way to insert the bullet train into the schedule at a more useful time for the majority of Worcester passengers. So while the times are odd, I understand why they have placed them where they are. e) We now have much more strong evidence that this train is a political invention. In a very insightful article, Gintautas Dumcius of MassLive.com reveals that the Worcester Chamber of Commerce (led by former Lt. Governor Tim Murray of Worcester) has been very active in the 'bullet' train discussions. And I am guessing that there was some involvement by current Lt. Governor Karyn Polito (a resident of Shrewsbury) given her involvement in rolling out the announcements of the bullet train. The statement from Secretary Pollack (from Newton - does everyone live on our line?) telling "them" that the train would run for a year and then be reevaluated certainly sounds like a response to a politically driven issue. We're talking about a train that's going 45 rail miles in 60 minutes. Not quite 'bullet' speeds. And now the MBTA is now quick to disown the 'bullet' name - even though they clearly invented it. It was on the draft schedule poster at Lt. Governor Polito's October 7, 2015 press conference. So they can disown it but it's been around too long to disappear now. And I doubt many of us will use the new "Heart To Hub" name. Other names from Twitter: "Politician's Express," "BS Express," "Dump to Hub," "Wormtown to Beantown," "Gut to Heart," "Ghost Train" (as in no passengers), "Clogged Artery & Broken Heart," "Pandering Limited," "Polito Special," "Polito to Pollack," "Murray Consolation Prize," "Catering to Millennials Special," "Heart Bypass," "Rosie Ruiz Extreme." h) This train has gotten more advertisement and press coverage than most recent candidates for political office. If I start seeing TV commercials for it, then I'll really be impressed. However, in a stunning example of tone deafness, posters advertising the "Heart to Hub" train have been spotted at stations BETWEEN Worcester and Boston. Why? What could that possibly do except aggravate customers who cannot possibly benefit from it and will probably suffer because of it? i) Up until now, the MBTA has implemented a safety rule that trains must have at least four coaches in the consist. The conventional wisdom has been that with less than four coaches, the train does not have enough brake pad surface area / braking power for full speed operation. So a train with less than four coaches is restricted to slower speeds. In the late winter / early spring, there were plans to test 3 coach consists with the intent that the new bullet train would only have 3 coaches. I haven't heard an update - but I can't see the bullet train having more than 4 coaches. It's also possible that they keep 4 coaches in the consist so that the set can be used more interchangeably for other trains regardless of the outcome of the testing of shorter trains. j) Funny thing - back in 1950, there were four round trips (or as the MBTA would call it, 8 trips) between Worcester and South Station with a total transit time of 57 minutes. And they stopped in Framingham AND Newtonville AND Back Bay ("Huntington Ave")! Hat tip to Ari Ofsevit and Otto Vondrak. k) There is a press conference with the Lt. Governor planned for the inauguration of the bullet train on the morning of May 23rd. I'll be there to stand up for my 1st amendment right to call it the 'bullet' train. And I won't be shy about telling the Lt. Governor what I think (politely, of course). Maybe she reads my blog and will already know? Natick Center loses peak inbound express service from P508. I have no problem with this move - their transit time on a local train is only around 45 minutes, while passengers west of Framingham have at least that much transit time on an express train. As I've explained in prior posts, there has to be an inflection point for local vs. express service, and West Natick seems to be a fair place for this inflection. Additionally, I think this change may be to try to alleviate some of the passenger load from P508. According to recent passenger counts, P508 has the highest ridership of any train on the entire MBTA Commuter Rail system (1423 passengers). It already uses the largest train set (8 doubles) in use on the system and it isn't clear if 9 car consists can or will be implemented. Taking some passengers off of P508 gives some breathing room for future natural passenger growth from outlying stations. Obviously it would be better if West Natick had much more parking in order to absorb the displaced Natick Center P508 refugees, but that would also not shift Natick area passengers away from P508. This is the best example of the MBTA being responsive to the comments (and an on-line petition) generated during the public comment period. It looks like West Natick passengers got more than they asked for with inclusion on all express trains (P504, P508, and P521 didn't stop at West Natick on the original draft schedule - now they do). 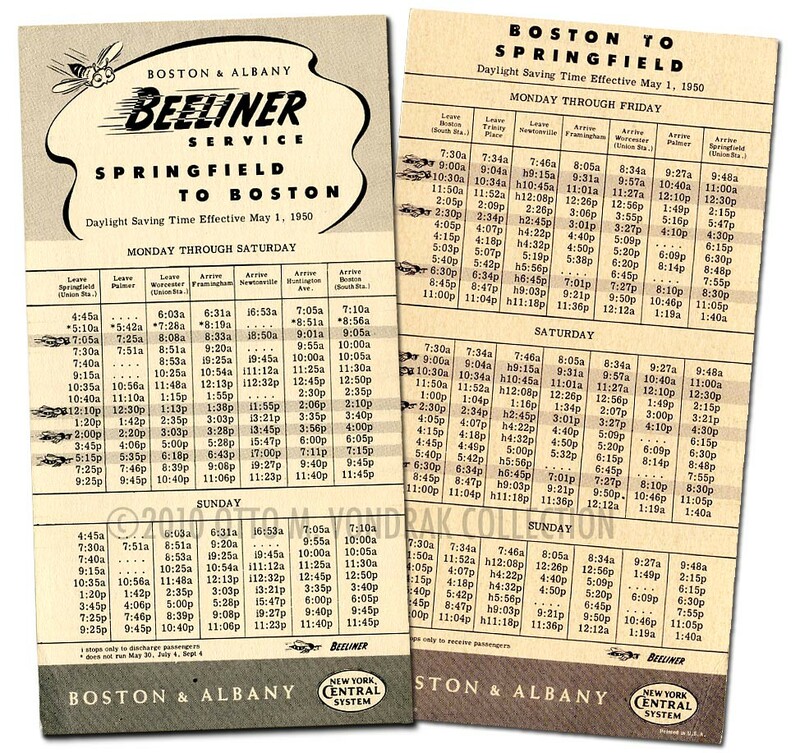 The original draft schedule had P510 skipping all three Wellesley stations. The final schedule has those stops restored. Fills a need for those passengers, and only costs an extra 8 minutes on the transit time. I'm neutral on this change, but it was responsive to a number of comments submitted to the MBTA. With platforms on track 2 only, it is difficult to provide appropriate or useful reverse commute service to the Newton stations. There just isn't a good solution with the infrastructure we have. Finally, I will work on an updated Turn Table for the new schedule and see if I can get it confirmed by the MBTA. Hopefully I'll be able to publish it next week. Come join me on the 23rd for the Bullet Inauguration! Looks like the MBTA has now published the official PDF versions and dropped the Heart-to-Hub verbiage completely from the schedule.... the bullets are now listed as 551 and 552. That's good, proactive planning to drop the name now. That'll make it easier next year when they convert that set to a badly needed zone express for the Grafton-Ashland crowd! :-) Perhaps they can swing it into the peak periods for AM (eg split up 506 like they had it in the Oct draft) and PM as well. Bullet was listed as 5001/5002 on January draft schedule. "Bullet" name was only on October 2015 draft schedule. So I never expected to see "Heart To Hub" on the schedule. I don't think they've dropped the name - I'm sure we'll continue to see the name used on marketing materials and on posters at the inauguration of the service on 5/23. It's still advertised as Heart To Hub on the home page of mbta.com. Odd that they have the formatted schedules linked from the individual line pages but have left the unformatted versions linked from the announcement page. Exactly my thoughts on splitting up P506 in the AM. That October draft schedule looked nice with that almost clock facing service. pic as part of the ad copy for the "Express" service. Lets see what happens when the "new" TT starts that Monday! Just checked with my bookie in Vegas and odds that the loco they use for the bullet inauguration press conference / kick-off has a "Heart To Hub" banner painted on or applied somewhere are running 12 to 1 odds on. I'm on the new 584 now which came 10 minutes late. I get on at Natick center. The crowd there was double the old 508 and 506 since we lost the inbound express. People standing in the aisle. At least standing on the old express 508 was for a short while...now it's standing on a local. I would go to West Natick for the 508 express but there is no parking available unless you go 20 to 30 minutes early and sit, so really it's for people who live in the condo association across the street as there is very little other housing there, especially when compared to Natick center. Given that this new local 584 local will realistically arrive at South Station at 8:50 or 8:55, the only option for Natick center people who need to get to their desk by 9 at the latest is the 506 at 7:21. That means leaving the house at about 7:05. I'll do much better driving. So I guess I'll be yet another one-person car commuting to Boston. Years ago I could take the 500 express bus from Riverside...now long gone. Natick center has far more people walking and riding bikes to the train than W Natick due to the density of population. A core mission of public transportation is to encourage this walking-based lifestyle rather than encourage sprawl by giving preferential treatment to outlying communities. This new schedule change does the opposite. How about having the 508 express skip West Natick since they got all the other express trains and can't accommodate any more parking? That would still alleviate head count on the 508 and not force a number of people back to driving the pike. Basing your decision on the first day? There are many variables with a schedule change of this magnitude, some of those include adjusting set sizes and getting used to the operational changes. Maybe they've already found something they'll fix tomorrow? Also remember there is still a ton of work happening on this line which could be impacting a few things too. Only way to know is see how the train does tomorrow. Nope, I would consider 10 minutes late to be an acceptable outcome given the change in schedule, work on tracks, etc. But today demonstrates how small the margin of error is for anyone boarding at Natick center (and starting work at 9) to take any train later than 7:20AM. If you start at 9 in Boston, you either have to take the 806 at 7:20 (leaving the house at about 7:05) or switch to driving (leave the house 30+ mins later). Scouting report: first 2 days P519 set is 3 doubles and 2 flats. Jammed SRO. No fare collection.